Many of us have followed the trials and tribulations of the struggling Scandinavians at Saab. The many owners and rebadged renditions of Chevys and Subarus. But now Saab is producing cars again, albeit ones you're not going to be able to buy. When Chinese company National Electric Vehicle Sweden (NEVS) finalized acquisition of Saab in all its bankrupt glory, a lingonberry branch of hope was extended to the brand long ago touted as "born from jets." 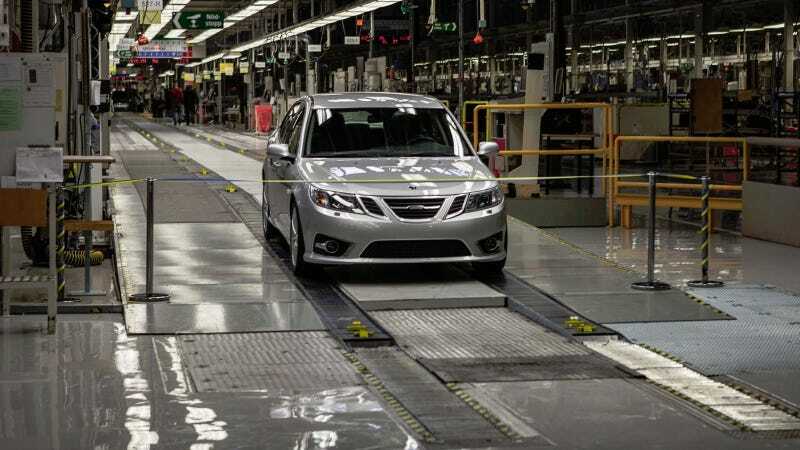 That was almost exactly one year ago, and today NEVS confirmed the news Saab enthusiasts may or may not have been holding their breath for: the first NEVS-owned Saab, a silver 9-3 sedan, rolled off the assembly line at 1:22 Central European Time. "Prior to our decision to start production of Saab cars, we need to finalize a few remaining dialogues to build partnerships with suppliers. We now know that the plant is ready for production." So, if this 9-3 was built by a company with "Electric Vehicle" in it's name, is it an alternative-propulsion Tesla killer? SaabsUnited reports that the NEVS intentionally built the "old version" of the 9-3 to essentially make sure the factory machines and supplier relationships hadn't collected too much dust. They also claim this car has "new goodies" under the hood but did not specific further... whether that means a bigger turbo, a 100-shot of nitrous, or one of those "hella JDM" socks on the brake fluid reservoir is anybody's guess. Their next move is apparently to introduce an exterior "facelift." Looks like baby steps is the name of their game, for now. Hey, I like the late 9-3's styling, and would love to see the ambitious individuals at NEVS breathe some new life into it. But I think they're going to need a lot more than a facelift to get those old car-planes off the ground. Hat tip and photo credits to SaabsUnited!